Is Pentair FNS Plus or Jandy DEV D.E. Filter Better? Why are there so many brands of pool equipment? And don't even get me started on all their products. It can feel overwhelming, especially if you're new to the pool scene. Here at River Pools, we don't stop at just manufacturing and installing fiberglass pools. We're enthusiastic about educating consumers just like you in order to make your pool life easier. Welcome to our comparison of Pentair vs. Jandy filters, Part 3! Side note: Jandy is owned by Zodiac, so as you're looking into these pool filters yourself, you might see either Jandy or Zodiac as the manufacturer. What are the Different Kinds of Pool Filters? The 3 types of pool filters are cartridge, sand, and D.E. filters. In Part 2, we discussed their sand filters. Today, let's talk D.E. filters! Pentair FNS Plus D.E. filter works for pools with 23,040 to 86,400 gallons of water, depending on the model. 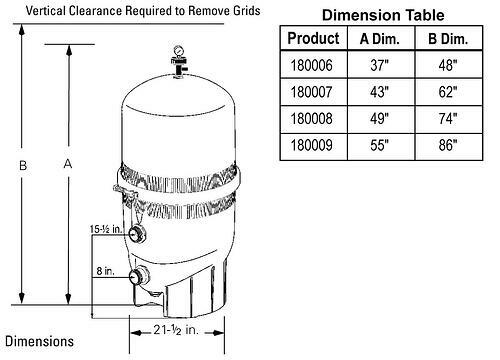 Filtration area options: 24, 36, 48, and 60 sq. ft. Reminder: This refers to the surface area of the filter media—in this case, the layered grids covered in D.E. powder, which do the actual filtering. 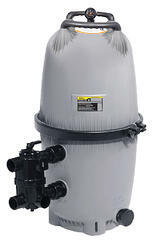 For more details, check out What Does a Pool Filter's Filtration Area Mean? D.E. requirements: 2.4, 3.6, 4.8, and 6.0 lb. This filter has a "Service-Ease™ Grid Pack," although Pentair doesn't specify exactly what that is—only that it lets you replace grids one at a time. It catches debris as small as 5 microns. The filter includes a high-flow manual air relief valve. It has a corrosion-resistant fiberglass tank. Jandy DEV D.E. filter works for pools with 34,560 to 57,600 (or more) gallons of water. Note: Amazon lists this filter as Zodiac DEV48/DEV60 Jandy DEV Diatomaceous Earth Versa Plumb Filter. 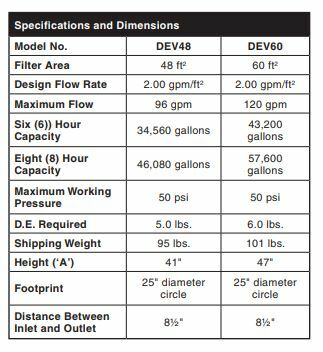 Filtration area options: 48 and 60 sq. ft. Reminder: This refers to the surface area of the filter media—in this case, the layered grids covered in D.E. powder, which do the actual filtering. Weight: 95 and 101 lb. Warranty: Jandy warrants that the DEV D.E. filter will be free of manufacturing and workmanship defects for a year. If you're doing your own research, be aware that Jandy isn't great about showing you the warranty upfront. It usually takes a little digging. They don't provide any warranty info on the product page, product manual, or site menu. The link to Warranty Information is about halfway down the Jandy homepage, and it's all generic information, not specific to this product. 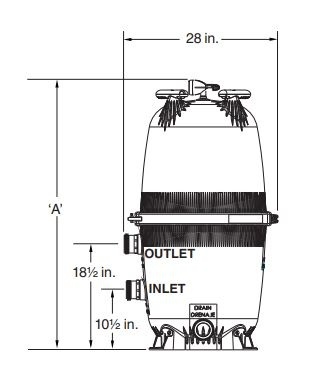 There are 3 backwash valve options available. Its heavy-duty, durable composite body is made of corrosion- and UV-resistant materials. Both D.E. filters catch debris down to 5 microns, have a 1-year warranty, and use curved grids for the filter media. There isn't much difference in terms of cost for similar sizes. Pentair's FNS Plus offers more size options. It's slimmer but taller than Jandy's DEV. It has a lower online rating, with multiple customers reporting issues with the tank cracking. Pentair doesn't specify the filter's whole weight or the grid pack they tout on the product page. Jandy's DEV offers 3 backwash options (compared to Pentair's single option). It has a larger drain, includes a convenient clean/dirty indicator, and has higher online ratings from customers. You can keep learning about all aspects of buying an owning an inground pool—check out our short videos on our YouTube channel and our Ultimate Guide to Inground Swimming Pool Maintenance. Previous: Is Pentair Sand Dollar or Jandy JS Side Mount Sand Filter Better? Next: What Does a Pool Filter's Filtration Area Mean?